AS BIG AS YOUR FACE!!!!! While we were in NJ last week we frequented one of my favorite pizza place’s: Benny Tudino’s Pizzeria. 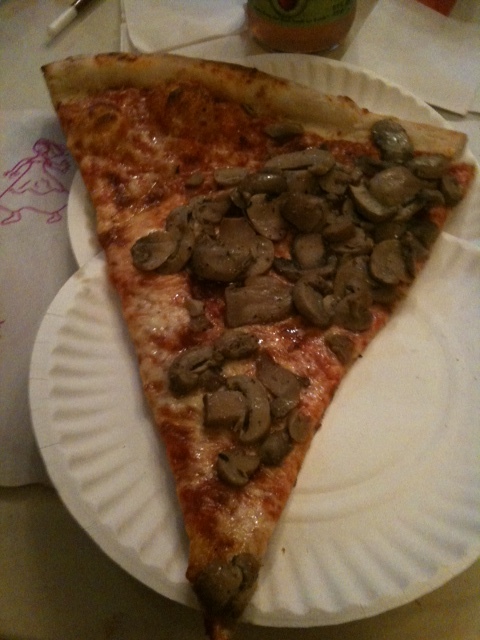 The first time I went to visit my brother in Hoboken he took me to this pizzeria and we each got one slice of pizza. When the waitress brought out the pizza slice I was astonished at the size and I proclaimed “THIS PIZZA IS AS BIG AS MY FACE!” The phantom of the opera could totally use this pizza as his mask. My brother laughed at my comment and it stuck as an inside joke between us. The slice covers the expanse of two plates and usually overlaps even those plates. You can get a moutain of toppings and the slice runs you about $4.00. A homeless mans feast. From that day forth, Pizza was changed for me. Nothing could quite compare to Pizza as big as your face. I took Cardin with me and since she doesn’t eat Pizza (she’s weird) I got her spaghetti. Luckily there was a bottle of grated Parmesan cheese on the table as we basically have to hide all of the spaghetti under a pile of cheese to get her to eat it. About halfway through our meal, Benny came out and sat down at the table across from us and was talking to some employees. We paid him no heed until Cardin started to gag and choke because she was refusing to eat any more of her meal. Quick to action I pointed to Benny and was all “See that man? That is Benny. And if you throw up in his restaurant he will yell at you.” Immediately she shut it down; her eyes lingering on his figure, contemplating my threat. I’m pretty sure I’ve damaged her psyche with Benny Tudino, but I do know that I did not have to clean up puke in his restaurant.